But does this verse overstate the case? Isn’t most of what people do on April 1 just harmless fun? How can April Fool’s jokes rise to the level of violence and damage suggested by this proverb, a picture resembling the evil we expect from Batman’s nemesis, the Joker? My local church Bible class on Proverbs puzzled over this question recently. It didn’t take long, however, for us to realize that this proverb was not talking about the kind of harmless fun we may have on April Fool’s Day. We quickly thought of quite a few cases of bad jokes that do real damage, for which this proverb’s description is not an exaggeration. Joke about carrying a bomb at an airport. Make a prank call to 911. Joke about wearing a wire to secretly record the President. Jokingly ask Russia to help us find missing evidence we’re looking for. Some jokes are done simply for the “fun” of playing with people’s willingness to believe. (Of course, it may be fun to us, but might look cruel to others.) But some games of pretend, which we sometimes call “hoaxes,” are done to do real damage to people’s lives, sometimes for our own personal benefit. This proverb talks about “deceiving” one’s neighbor and then claiming that we were only “joking / playing / in sport” (for the meaning of this word, see my post “Laughing, Playing, and Beyond Child’s Play” at https://www.patheos.com/blogs/tomhobson/2017/10/laughing-playing-beyond-childs-play/). To jerk people around like this, we are told, is to “behave like a madman,” like the Joker in the Batman series. Such behavior can do serious damage that we may have never intended. Don’t let this post spoil your April Fool’s Day. It can be fun to pretend, “What if this comical claim were true?” One hilarious April Fool’s joke I remember was when a conservative talk show host pretended for two hours on his show that he had converted to radical liberalism. He had many of his listeners worried, but others kept in mind that it was April 1. Credibility is like gold in the bank. We are foolish to throw it away. Sometimes, we desperately need people to believe us, when what we say is hard to believe. 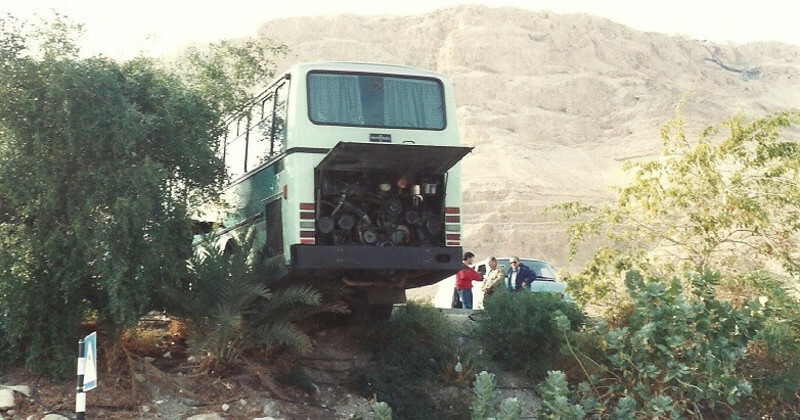 When I was at Masada in Israel in 1993, I was told that our tour bus had backed off a cliff. I thought it was an April Fool’s joke, even though it was early February. But then I saw that it was true: the back wheels of the bus had gone off the edge of the parking lot, and the back of the bus was hanging in mid-air! (See picture.) Sometimes, we need people to believe that we are not joking! The resurrection of Jesus Christ is no joke. It is not a pet fairy tale. If we want people to believe what we say about Jesus, people must be able to trust the rest of what we say. And yet, what’s the best evidence we have that Jesus had a sense of humor? He chose fishermen to spread the Truth. That took faith!